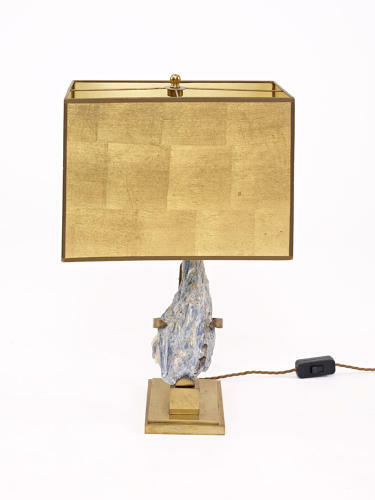 Belgium brass table lamp from circa 1970. Brass frame with clasps around a mineral specimen of Kyanite (bluey grey). In the style of Willy Daro. Very unusual and beautiful card shade with a gold patterned exterior and antique gold interior. Great condition and certified and rewired. The shade measures 32 cm wide and 20 cm deep. The specimen is 20 cm high. The brass base is 16 cm deep and 12 cm wide.